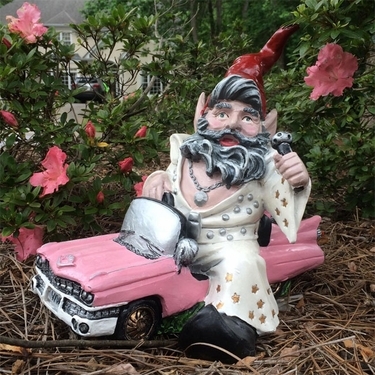 From our Premium collection, our Amazing New Vegas Gnome Riding in a Pink Cadillac is one of the nicest gnomes we've every carried. Incredible detail, this figurine is a work of art for the most discriminating gnome lover! Never without a mic in hand, the King of Gnomes in flashy star attire is ready to take on Vegas and all those lying Hound Dogs is his super studded flair. A must for any collector!